There’s something endearing about old fashioned romance, no matter the occasion. But that’s especially true at Valentine’s Day. 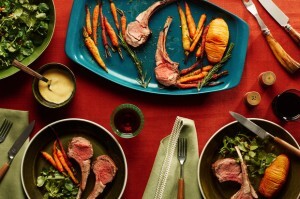 This Valentine’s Dinner menu is fun not only because it’s retro, but also because it features a mustard-based salad dressing and lamb chops cooked with rosemary and garlic for VDay. 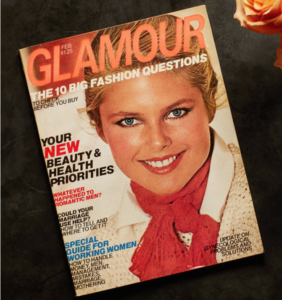 The author was inspired by a Valentine’s menu featured in a 1977 issue of Glamour (is that a super-youthful Christie Brinkley on the cover?!! We digress…). It’s a fun read with the authors thoughts and links to recipes. While any of our Dijons on our French mustards page would be excellent for the mustard-based salad dressing, consider Delouis Fils Dijon Mustard (DLF100) or Edmond Fallot Dijon (EFL100). For the lamb, we suggest you simply salt & pepper your rack of lamb or chops (or even a roast) and then generously schmear on some Daddy Cook’s Honey Roasted Garlic Onion Mustard (DDC104) for cooking to make a super easy variation of what’s listed on Epicurious. And, you know, the carrots will be even more delicious when glazed with Dr. Pete’s Praline Mustard Glaze (DRP100) just before the end of roasting. YUM! Stop by the Mustard Museum & Gourmet Gift Shop for these and other easy VDay dinner & dessert ideas!